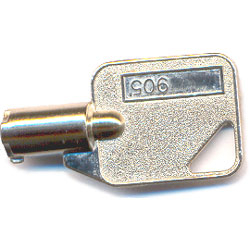 Replacement metal barrel case key for atomic ONLY Acroprint ES900 time clock (WITH atomic time synchronization and internal LED light.) Serial Number begins with 51. Otherwise select: Acroprint Key ES900 (non-atomic clock).